The BBC is to screen an item in Newsnight any time soon on the subject of the FFR. We have been given sight of the questions the BBC has posed and offer the following notes that may help understanding of what is being said. Most of the content has appeared in other forms over recent months so it will probably be the case that it is “not the BBC asking the questions”. The Upholstered Furniture Fire Safety Regulations are referred to as the FFR and flame retardants are referred to as FRs. Fire Resistance or Burning Behaviour? The first thing we would like to do is let you into a secret: The FFR and the testing methods used are based on Resistance to Ignition. Small ignition sources of a smoulder and open flame type are applied to the test samples and that performance is the basis of trying to prevent upholstery igniting. They are not based upon burning behaviour, that is, how they behave in a fire scenario. It’s not really a secret but a lot of people don’t seem to understand it so it looks like a secret. If you still have trouble understanding then look at the Pink Cushion in Newsletter 34. Did it burn? Did it cause a bigger and rapidly escalating fire with a large amount of dirty smoke and toxic fumes? Was anyone injured or killed? Will it appear in any fire statistical data? If it is still not clear then look at our Definitions page under How do flame retardants work? This is very important because the FFR has received a lot of attacks from various quarters with an interest in portraying them as “not working” but nowhere do they refer to the original concept behind the FFR: Ignition resistant furniture. This is ignition resistant furniture in action. Its difficult to say that no damage was done but at least it did not escalate into a much bigger fire. The recent scientific work used to inform the BBC’s arguments and questions is based on evaluation of what happens in a fire and in case you didn’t know it – FRs are irrelevant in such a scenario. The toxicity or rather what chemicals are present DURING a fire is extremely complex and eventually transitory because either everything burns or the fire is put out. Industry very seldom finds circumstances where FRs can influence fire testing procedures that are designed to determine performance in a fire scenario – or burning behaviour. FRs are chosen to be activated by the application of relatively small ignition sources of 2 specific types hence the FFR is often described in terms of cigarette and match test ignition. They are activated at relatively low temperatures, or better, as soon as the fire reaches them. The objective is to produce ignition resistant furniture. Something to think about: Every man made interference in a fire burning will make it more “dirty” and toxic except if you throw another log on the fire and even that will tend to cause a temporary increase in smoke. This is explained in our fire triangle definition. The concept of burning behaviour comparisons of UK and EU furniture is difficult to understand because we must presume that to make the UK sofa burn an ignition source greater that the test specification must have been used and that is totally outside the scope of the FFR. So we must ask the question. What point is being made? The temperature of a fire where increased toxicity existed would be beyond survival. Are we being told that trying to prevent fires is not worthwhile? If this is the intention then it should be made more clear. Statistics do matter because statistics never lie? The problem is that to answer the question about the New Zealand statistics and sofa toxicity questions you again have to understand the ‘Ignition Resistant’ point. 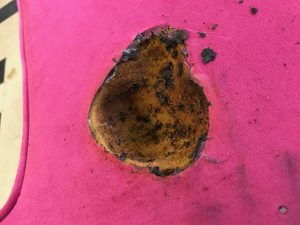 If it is not clear yet then answer this question: Where would the incident of the pink cushion appear in the statistics? If you then ask yourself what would happen to UK statistics if no FRs were used then it would be reasonable to say that UK statistics would have higher injury and death figures – but only if you accept the point that without FRs there would be more fire incidents or ask the question did the incident of the pink cushion not happen? The camera doesn’t lie! The question about ‘why New Zealand’ is also important. We must presume because the figures coincided? Of all the countries in the World? Are there no others? Sweden for instance? The analysis of such statistical data requires a little more qualification than that. Just look at the pink cushion and think ‘consequences’? Defining toxicity is important. It is also important to recognise the circumstances. In spite of industry stopping the use of DecaBDE it has never been classified as toxic or carcinogenic. It was used by industry because there was no evidence of toxicity in the EU Risk Assessment report and no guidance indicating toxicity in the MSDS. Such guidance would have required a risk assessment to be made that would have included any risks that could have been passed on to the consumer in the final articles and industry would have responded accordingly. Nevertheless, industry has, as they always do, accepted the decision on the classification of DecaBDE and again taken action accordingly. There are very well defined methods to determine the toxic effects of substances. There are regulations concerning the independence of the testing and third party scrutiny of the results. There follows very strictly regulated requirements for the publishing and the informing of users of this testing and everything relevant that is known must appear in the Manufacturer’s Safety Data Sheet (MSDS). Users of the chemicals must receive this information. We have all seen the MSDS of the substance called DecaBDE and it contained no data on carcinogenicity or toxicity and that was for a very simple reason: there was no evidence. It is difficult in these circumstances to understand where claims about the toxicity of DecaBDE come from. There was no evidence of it causing cancer. The lack of evidence is often glossed over with the suggestion held in the phrase “linked to..” unfortunately such information is not admitted into the production of an MSDS. Neither is the size of the Risk Assessment Report any indication of actual risk. The “new” testing regime proposed by BIS was ill conceived and totally untested. Any testing done by industry subsequent to the publishing of the proposals gave very mixed results and included instances where MORE FRs were needed to meet the test requirements. As it was a Government department I guess we can say “Omnishambles”. The tests totally subverted the test method development procedures of the British Standards Institute and would not have met industries needs for a reliable test procedure. The suggestion that they were more able to represent modern manufacturing techniques does not withstand scrutiny.